Chesapeake “LTJ” Slam Tshirts are in! Walleye Pete – Chesapeake Bay Light Tackle Fishing Guide. Walleye Pete’s 2012 Fish of the Year! My friend Joe Poye and his sons have fished with me for a few years. 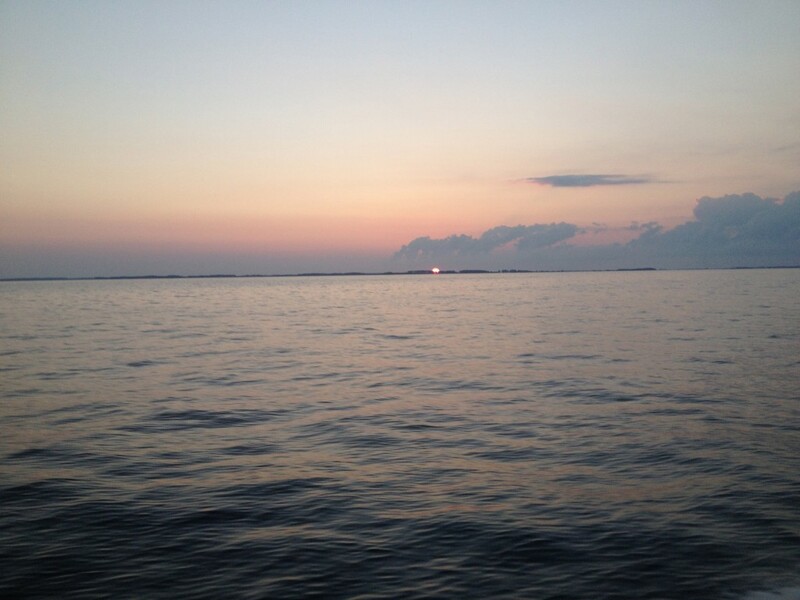 They love to roll over to the eastern shore for not only the fish but the beauty of it all. Every trip they have a great time harrassing each other and competing to catch the biggest fish. 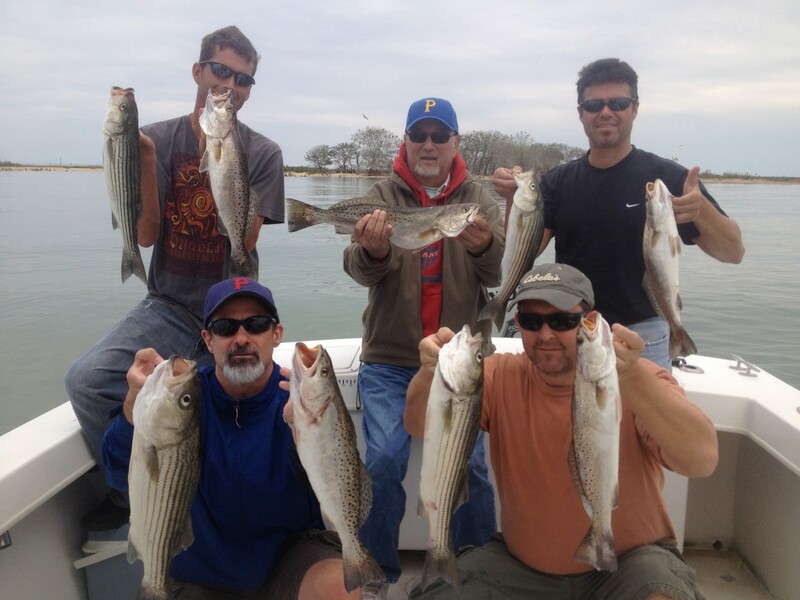 Joe Sr. along with his 3 sons and son-in-law booked a Speck trip for Oct 1, 2012. Prior to the trip one of Joe’s sons contacted me ahead of time to let me know Joe Sr. was sick. Joe was stricken with cancer and had been battling it for about a year. I was told treatment was over for now and Joe Sr. wanted to do the family fishing trip out on the bay with the boys. 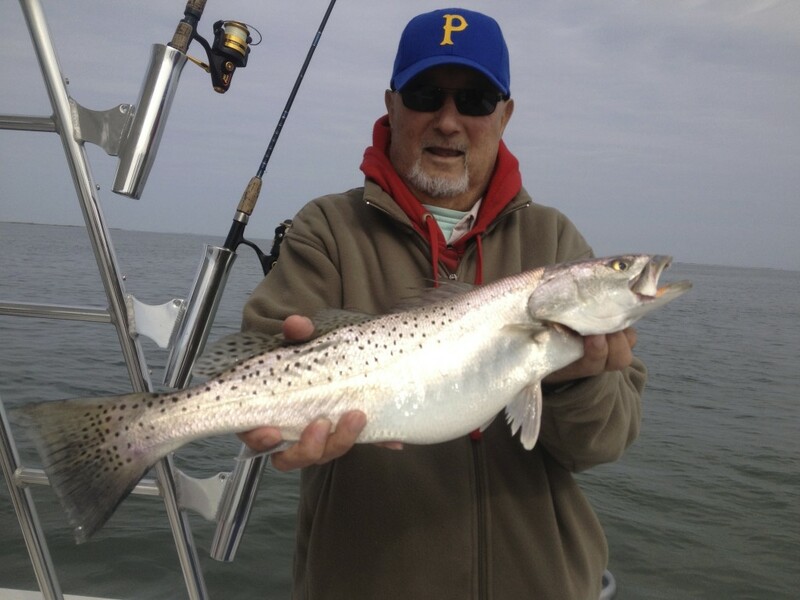 Beautiful Peace On Chesapeake Bay…..
Joe Sr. and the boys arrived bright and early Oct. 1. A beauty of a weather day was forecasted and the Speck fishing was looking very positive. Shook hands with Joe Sr and we loaded up the boat. Although Joe Sr. was sick he certainly did not seem it and was very happy with the day’s outlook. It’s wonderful when a trip is better than expected! I was optimistic about the fishing prospect but was overjoyed when Stripers and Specks were really hungry and the seas were flat……All the boys and Joe had a great day catching and having fun with each other……Joe Sr. fished most of the day, he’d take a break here and there but kept fishing hard wanting to “best” the boys all in good fun. The day was drawing to an end and Joe Sr. did not have the biggest Speck. We were drifting a great area where I knew some Specks had to be hungry. We caught some….none biggest of the day but it could happen any moment. Out of the corner of my eye I saw Joe Sr’s rod tip sharply pop up and then the rod bent down hard!…..Joe Sr. hooked a big one! The fish pulled some drag and wasn’t quitting, the boys quit fishing and watched excitedly. Joe fought the big Speck perfectly and the net was slipped under. Biggest of the day for sure! The boys were very happily surprised and thrilled to see dad grin as the biggest Speck of the day came in the boat. Dad was happy…..not just for the fish but being able to have a good time with his boys. Joe and his winner of the day and 2012 FISH OF THE YEAR!!! We soon called it a day heading back across the bay on a beautiful afternoon! Joe and his boys at the end of our epic speck catching day! Joe Sr. passed away Dec 3, 2012. RIP Joe……Privileged to have fished with you and your boys! God Bless! Great story Pete! moments like these make some of the lousy days , blown engines, crappy weather, rude people, etc all worth it! great story Pete, thanks for sharing. I could only hope you might some fine day write something similar for me. Thank you Pete, a great story about my Dad. He had such great times fishing on your boat! Pete I am Joe’s sister and I want to tell you the tributes you have posted about my brother are wonderful. He was a wonderful man, and he looked so good in those pictures it breaks my heart to know how he suffered. He loved those fishing trips, and how fitting that he would be the one to have the catch of the day. August Is Coming Up BIG! Awesome catching this week! Fishing Report and Walk-On Trips! Short Notice Walk-On Trip for this Thursday, 27 April! Updates to the boat…..thanks Judge Yacht, Annapolis Boat Sales and Reliable Marine!